Chances are that if you've found your way to Hi Mountain Bison & Buffalo Hunts, you're interested in hunting a buffalo at some point in your hunting career. Our website is primarily focused on helping buffalo hunters get the information they need in order to make an informed decision about their choice to hunt a buffalo at our ranch. If that's the case for you, we have plenty of information that you can read through so that you'll know exactly what to expect. 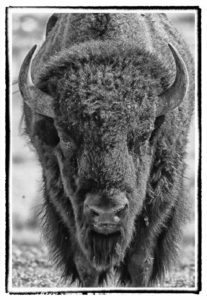 You'll find buffalo hunt prices on our hunt reservations page, a frequently asked questions section, and a buffalo gallery that you can look over to get an idea what our ranch looks like. However, if you haven't put much thought to the idea of hunting a buffalo, you've also come to the right place. Part of the reason that Hi Mountain Bison & Buffalo Hunts exist is because we love buffalo, and we want to share the experience of these beautiful creatures with everyone who visits the ranch. North American bison are some of the most beautiful animals that have ever lived on our continent and can be absolutely breathtaking (and terrifying, if you aren't mindful of their power and respectful of it). The purpose of this part of our website is to help educate people like you about buffalo. We'd like for you to come to the ranch ready and able to appreciate exactly what a buffalo is because we feel that if you take the time to prepare yourself by learning about buffalo, you'll enjoy your experience that much more. 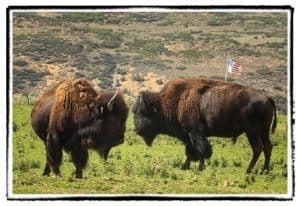 With that in mind, please feel free to take the time to read through our information about American buffalo, including some of their history, what makes buffalo unique, and how you can incorporate buffalo meat into your diet (it's actually better for you than beef, and tastes great). Lastly, if you find any information missing from our website or have questions that aren't answered here, please let us know by getting in contact with us. We'd love to hear from you.